The rain this week has made a right mess of my garden. The dahlias are bedraggled, the roses ruined. I figured my berry bushes would be sad and soggy too, but I was wrong. 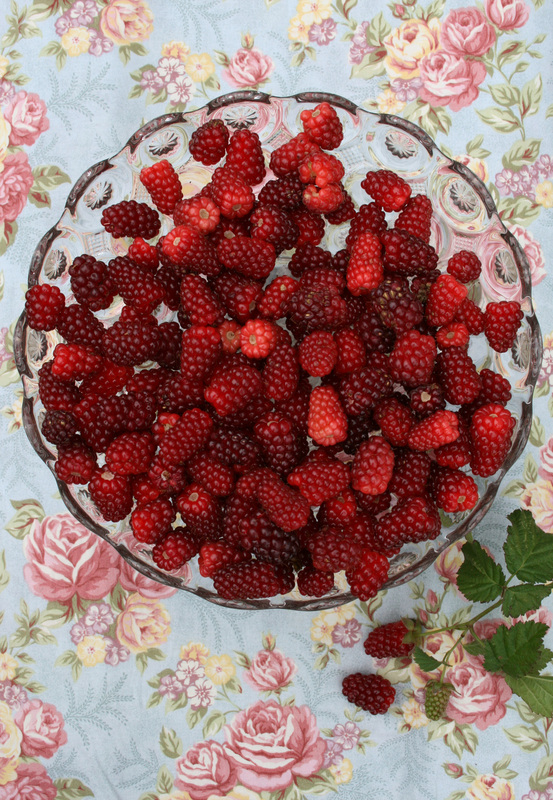 I just picked the first 1kg of sweet ‘Thornless Jewel’ boysenberries from our orchard. I’ll have to pick them daily from now on because my bird netting isn’t all it should be: in fact there must be a border collie sized gap at one end because our dog somehow managed to get stuck under it. Thanks for all the great blogging over the last year Lynda. Hope you and your family have a great Christmas. You’ll have fun being Mum & Dad for the first time. What yummy-looking berries! I bet you enjoyed them. Summer fruit is the best and eating it is distracting me from the unwelcome news that yellow kiwifruit are going to be a thing of the past, because that variety is so susceptible to the dreaded PSA (?) virus. I much prefer the yellow to the green ones, which all too often seem to go from rock-hard to rotten without ripening in-between. Warm Christmas and New Year wishes to you, Lynda, your new family and all your readers. Wow your berries look awesome – have had a couple of kg’s off my raspberries but wondered why the end of my row the berries are only half developed before ripening, even to the point of only having one little bobble on them. Wondered if you could help! Rest of the crop is fantastic! Lynda, thank you for such a great website and blog. I love hearing all about what is going on at Hacienda Hunua, and your garden tips are always so helpful. I wish you, your family and colleagues the very best for 2012 and look forward to a great growing year. I especially want to know who hexed my garlic crop this year. I bought good seed, planted a crop in a raised garden bed that had previously grown tomatoes and another crop along the fenceline in the outside garden. The crop in the raised garden bed got fed with worm juice, watered, and pampered. The crop along the fenceline took its chances apart from a bit of watering every now and then when things got hot. I have just harvested the raised garden bed crop. None of the bulbs are any bigger than my thumbnail, and from the size of the tops of the crop along the fenceline, I dont anticipate them being any bigger. Could it have been the seed? I have certainly had better crops in other years. Warm regards for a safe and fruitful New Year.